Subscribe to get deals from hundreds of merchants including the best of Jade, The Fullerton Hotel Singapore! Offer not valid for Jade's Dim Sum Treasures (available for weekend lunch only). Promotion is valid from 15 January to 31 December 2019.. Payment must be charged to a Citibank Credit/Debit Card to enjoy the promotion.. Promotion is not valid with other promotions, discount cards, promotional vouchers and in-house offer discount cards.. Promotion is valid for a maximum of 8 pax per bill.. Promotion is not valid on the eve of and on public holidays as well as special occasions such as 15 days of CNY in Jade Restaurant, Valentine's Day, Easter weekend, Mother's Day weekend, Father's Day weekend, F1 weekend and Thanksgiving Day and may include others as determined by the Merchant, unless stated otherwise.. Prior dining reservations are encouraged and is subject to availability.. For dining reservations or enquiries, please call (65) 6877 8911/12 or email dining-rsvp@fullertonhotel.com.. Citibank's and The Fullerton Hotel Singapore's decision on all matters relating to the Promotion will be determined at its reasonable discretion and is final and binding on all participants.. Citibank shall not be responsible for the quality, merchantability or the fitness for any purpose or any other aspect of the products and/or services provided by third parties and Citibank shall not at any time be responsible or held liable for any loss, injury, damage or harm suffered by or in connection with the products and/or services provided by third parties. All disputes about quality or performance of the product and/or services shall be resolved directly with The Fullerton Hotel Singapore.. Citibank and The Fullerton Hotel Singapore reserve the right, at their reasonable discretion, to vary, add to or delete the Promotion terms and/or terminate the Promotion at any time.. "Citibank" refers to Citibank Singapore Limited and "Jade Restaurant", "Town Restaurant", "Post Bar", "The Courtyard", and "The Lighthouse Restaurant and Rooftop Bar" refer to Hotel Properties Limited, currently trading as The Fullerton Hotel Singapore.. Please always check with the merchant on the validity of the promotion before purchase. Promotion is valid from 15 January to 31 December 2019. Promotion is not valid with other promotions, discount cards, promotional vouchers and in-house offer discount cards. Promotion is valid for a maximum of 8 pax per bill. Promotion is not valid on the eve of and on public holidays as well as special occasions such as 15 days of CNY in Jade Restaurant, Valentine's Day, Easter weekend, Mother's Day weekend, Father's Day weekend, F1 weekend and Thanksgiving Day and may include others as determined by the Merchant, unless stated otherwise. Prior dining reservations are encouraged and is subject to availability. Citibank's and The Fullerton Hotel Singapore's decision on all matters relating to the Promotion will be determined at its reasonable discretion and is final and binding on all participants. Citibank shall not be responsible for the quality, merchantability or the fitness for any purpose or any other aspect of the products and/or services provided by third parties and Citibank shall not at any time be responsible or held liable for any loss, injury, damage or harm suffered by or in connection with the products and/or services provided by third parties. All disputes about quality or performance of the product and/or services shall be resolved directly with The Fullerton Hotel Singapore. Citibank and The Fullerton Hotel Singapore reserve the right, at their reasonable discretion, to vary, add to or delete the Promotion terms and/or terminate the Promotion at any time. "Citibank" refers to Citibank Singapore Limited and "Jade Restaurant", "Town Restaurant", "Post Bar", "The Courtyard", and "The Lighthouse Restaurant and Rooftop Bar" refer to Hotel Properties Limited, currently trading as The Fullerton Hotel Singapore. Asian Masters participating restaurant.. Promotion is valid from 1 Mar 2019 to 31 Aug 2019.. Not valid with other discounts, promotions, privileges and/or offers.. Management reserves the right to alter any terms & conditions without prior notice.. To utilize the Offer, please present a Citi card before ordering, and full payment must be made with a Citi card.. Offer is not valid on the eve and day of public holidays as well as festive occasions such as Mother's Day, Father's Day and Valentine's Day.. Promotion is valid from Mondays to Sundays for a-la-carte food items (except for the eve and day of public holidays as well as festive occasions).. Please always check with the merchant on the validity of the promotion before purchase. 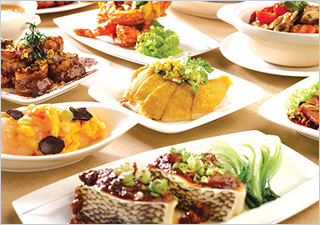 20% off à la carte weekday lunch and daily dinner food bill for HSBC Visa Infinite Credit Cards. Offer is not valid for weekend Gourmet Dim Sum Treasures. Until Date 30 December 2019. The Offers are valid for dine-in only, unless stated otherwise. All payment must be made with a HSBC credit or debit card. Reservations are required and up to a maximum of 8 persons per reservation. Please quote “HSBC Dining Privileges“ when making a booking. Merchant terms and conditions apply. The promotion is not valid in conjunction with other promotions, privileges and vouchers. Not valid on eves of public holidays and on public holidays as well as special occasions such as Valentine’s Day, Easter weekend, Mother’s Day weekend, Father’s Day weekend, F1 weekend, and Thanksgiving. HSBC accepts no liability for the quality of goods and services provided by the Merchant involved in this promotion.. Please always check with the merchant on the validity of the promotion before purchase. The Offers are valid for dine-in only, unless stated otherwise. All payment must be made with a HSBC credit or debit card. Reservations are required and up to a maximum of 8 persons per reservation. Please quote “HSBC Dining Privileges“ when making a booking. Merchant terms and conditions apply. The promotion is not valid in conjunction with other promotions, privileges and vouchers. Not valid on eves of public holidays and on public holidays as well as special occasions such as Valentine’s Day, Easter weekend, Mother’s Day weekend, Father’s Day weekend, F1 weekend, and Thanksgiving. HSBC accepts no liability for the quality of goods and services provided by the Merchant involved in this promotion. Promotion Period: 02/10/2018 to 30/12/2019. Valid for a max of 8 customers per bill.. Not valid for Jade's Dim Sum Treasure on Weekend.. Prior reservation is required, subject to availability.. Offer is not valid on eve of and on public holidays and special occasions such as Valentine’s Day, 15 days of Chinese New Year (at Jade only), Easter Weekend, Mother’s Day, Father’s Day, F1 Weekend and Thanksgiving, and may include other blackout dates determined by the merchant, unless stated otherwise.. Not valid with any other ongoing / in-house promotions, vouchers and/or discounts, or on eve of and on public holidays, unless otherwise stated.. The hotel reserves the right to vary and amend any of the T&Cs without prior notice.. DBS General Promotions Terms & Conditions apply, visit www.dbs.com.sg/dbscardstnc.. Please always check with the merchant on the validity of the promotion before purchase. Not valid for Jade's Dim Sum Treasure on Weekend. Valid till 31 July 2018. PAssion Card must be presented upon payment. Not valid with any other discounts, promotions, privileges or vouchers. Weekend Package is available for booking @ http://bit.ly/TFHSSPL only (PAssion Silver Card Members). Prior reservation for rooms is required and are subject to availability. Hotel blackout dates apply. Room rates are subject to service charge and prevailing government taxes, and are subject to change without prior notice. Valid for dine-in only for up to 8 persons per PAssion Card. Prior reservation is required and walk-ins are subject to availability. Call 6877 8811 or 6877 8912, or email dining-rsvp@fullertonhotels.com for reservations. Not valid on eve of and on Public Holidays, and special occasions such as 15 days of Chinese New Year, Valentine's Day, Easter Weekend, Mother's Day, Father's Day, F1 Weekend and Thanksgiving. Other blackout dates apply. The management reserves the right to amend the terms and conditions without prior notice. Please always check with the merchant on the validity of the promotion before purchase. Jade is a modern Chinese restaurant helmed by Master Chef Leong Chee Yeng. Dressed in glorious shades of silver and gold, the restaurant exudes elegance and class. With 2 private dining rooms and 2 partitioned areas, the 120-seat establishment provides necessary exclusivity for special occasions. With exquisite dim sum, wholesome soups and signature dishes like the Braised Egg Noodles with Boston Lobster, Shimeiji Mushrooms and Golden Mantou Stuffed with Spicy Crab Meat and their popular Peking Duck, Jade showcases sophisticated dishes meant to satisfy the taste buds of diners which leaves them coming back for more. Quality buffets are also provided, accompanied with great service and warm attitudes.